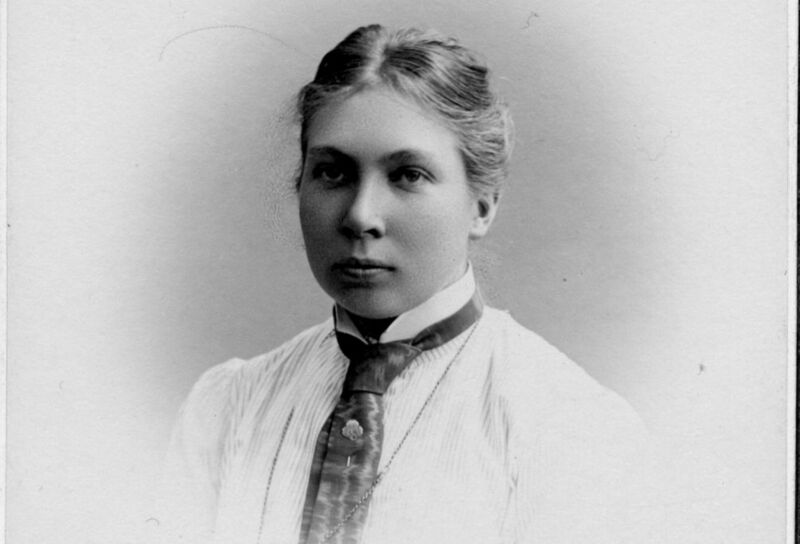 Maja Beskow was a drawing instructor and the first female teacher at Umeå general secondary school. Maja Beskow was born in Öregrund in 1877. Her mother, Hilda Linda, had also been born in Öregrund as the daughter of a naval captain and she also married a naval captain, Maja Beskow’s father Johan Edvard Beskow. The couple settled in Öregrund, a popular health and seaside resort to which members of high society flocked for rest and recreation in the late 19th and early 20th century. When Maja Beskow was nine years old the family moved to Stockholm. They maintained contact with Öregrund, however, and she retained a love for the sea for the rest of her life. The Beskow household was a religious one. The family numbered several preachers and Maja Beskow often attended when her relative, Gustaf Emanuel Beskow, was preaching. His daughter, Elisabeth Beskow, became a close and loyal friend of Maja Beskow’s. She was, for a time, one of Sweden’s most read authors who, under the pseudonym of Runa, published a large number of books, both within Sweden and abroad. After her death Maja Beskow released a biography of her friend in 1932. Maja Beskow and her two-year-older brother John gained their education in Stockholm. She attended Högre allmänna läroverket för flickor (general secondary school for girls) in Södermalm, and in 1897 she enrolled at Tekniska skolan, now known as Konstfack (University College of Arts, Crafts and Design). Three years later she graduated from the teacher training course of the Högre Konstindustriella (advanced industrial art) section. During the summer of 1900 she attended a handicrafts course at Nääs handicrafts seminar in Västergötland. In the autumn of the same year Maja Beskow obtained a temporary post as drawing instructor at Umeå högre allmänna läroverk. Her duties included teaching both drawing and handwriting. When she arrived in Umeå as a 23-year-old she was received by Carl Niklas and his wife Johanna Pahl, who were family friends of the Beskows. They became Maja Beskow’s safe spot during her early period in Umeå. Carl Niklas Pahl was a teacher at the school which at the time was an entirely male environment. Only boys were allowed to study at the school and women were not allowed to hold state posts. Thus Maja Beskow had to seek royal dispensation from the king when her predecessor died and she – despite advice to the contrary from the school principal – wanted to continue in the permanent post as drawing instructor at the school. Maja Beskow was duly awarded her post in 1903 and remained the sole female at the school for a further two decades. It was not until the autumn semester of 1923, when female pupils became legally admissible to the school, that Maja Beskow gained her first female colleague in the deputy physical education teacher who was employed to teach the female pupils. “Behörighetslagen”, a law which gave women access to most official state posts, was introduced that same year. A few individual female teachers had been employed at the school previously. Like Maja Beskow they largely taught so-called practical subjects and thus did not pose a threat to the male profession. When girls finally gained access to the school Maja Beskow took on the role of supporting and uniting the initially small number of female pupils. In 1925 the women’s high school association Orbis was established thanks to her encouragement. Orbis showed its gratitude to Maja Beskow for many years. Maria Beskow day was celebrated even after she had retired and the annual tradition of performing the Lucia celebration at Ms Beskow’s home was kept alive right until the last year of her life. In her professional life Maja Beskow was used to being the lone woman but privately she maintained a large network of friends across all of Sweden. These included teachers and artists, many of whom she had come to know during her studies at Tekniska skolan in Stockholm. With the benefit of the scholarships she had been awarded in order to further her training as a drawing instructor she travelled to Denmark, Switzerland, the Netherlands, Germany, and Italy. After a few years of living on her own in Umeå Maja Beskow moved in with Julia (Juliana) Byström, whom she had met through functions organised by Evangeliska Fosterlands-Stiftelsen (EFS, Swedish Evangelical Mission). Julia was 20 years her senior, unmarried, and a teacher at the primary school teacher training programme in Umeå. It was their shared deep religious devotion that brought them together. Further to EFS Maja Beskow was involved in several associations. She joined Kristliga föreningen av unga kvinnor (KFUK, Young Women's Christian Association), and Kristliga föreningen av unga män (KFUM, Young Men's Christian Association) and she was one of the forces behind the setting up of Umeå’s scout corps. She had earlier been active on behalf of the deaf and had learned sign language and she began to arrange activities for the deaf in Umeå and became a supporting member of Umeå deaf association. Given that she was both a child of, and a grandchild of, naval captains she felt strongly concerned for the well-being of seamen and their options for sober lives. She used her involvement in the Sjömännens vänner (Seaman’s Friends) association to set up a seaman’s mission in Holmsund, near Umeå, which was finally realised in 1943. Through her career choice she also became a member of a number of associations. Maja Beskow sat on the board of Teckningslärarnas Riksförbund (TR, “national drawing instructors’ federation”), established in 1914, and she remained a driving force in the northern section, Norra Sveriges teckningslärarföreningen. Throughout Maja Beskow’s professional life she suffered from failing health. She also struggled to gain the ear of the school board with regard to serious breaches in the working environment. She suffered from severe headaches and intestinal pain for many years and she began to suspect that she had been poisoned by arsenic. She spent the years of 1921-1922 entirely off work with ill-health in the hopes that the school authorities would act on the matter. Eventually it was revealed that the school walls had been painted with paint containing arsenic. Maja Beskow was off work for health reasons for lengthy periods, dating from 1906 and right up until her retirement in 1937. The last five years of her life she was unable to teach at all due to her poor health. Although her working life ended earlier than it should have Maja Beskow still managed to leave an unforgettable impression on both students and colleagues during her time at the school. She was described as having one of the most colourful personalities at the school who successfully gained the students’ respect and confidence through her professionalism and honest engagement. Maja Beskow died in 1964. She is buried in the same grave as Julia Byström at the Västra cemetery in Umeå. Nanna Maria (Maja) Kristina Beskow, www.skbl.se/sv/artikel/MajaBeskow, Svenskt kvinnobiografiskt lexikon (article by Karin Holmgren), retrieved 2019-04-20.